Food Additives, What Are They? They are chemicals that are added to food to improve its shelf-life, appearance and flavour. Additives include ascorbic acid, which is used to prevent food from going off, emulsifiers to help mix oil and water together, and active packaging that improves the quality or safety of food. What Are The Risks Of Food Additives? Saccharin: linked to cancer is laboratory animals. Top What are the recommendations? All additives in the UK and Europe are controlled by law, and can only be used following stringent tests and approval by an independent committee of scientists and medical experts. However, some scientists have linked additives - particularly tartrazine or E102 - to hyperactivity in children, allergies, asthma, migraines and even cancer. Several studies have now been published which show additives such as colourings or sodium benzoate can adversely affect the behaviour of children aged between 3 and 9 years old, such as one in The Lancet in 2007. The British Nutrition Foundation (BNF) believes more research is needed before any firm link is established between additives and allergic reactions. But it does not rule out the possibility. 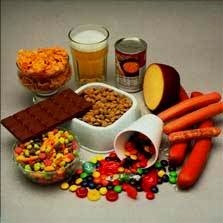 According to the CSPI many additives should be avoided for health grounds.